Over the past 6 years we have had the privilege to train some of the BRIGHTEST TALENT in Arts, Entertainment, and Media, YOUNG LEADERS who have planted Houses of Prayer in Cities & Campuses across America, and JUSTICE CHAMPIONS who have stepped into the front lines of fighting Human Trafficking. Not only have over 250 people graduated from the Launch Discipleship School in Hollywood but each have built relationships to last a lifetime. This Summer - we are excited to welcome another class of World Changers. From June 18th to July 15th - we will be spending 4 incredible weeks of preparing ourselves to step into our God-given destinies. 1 Month, 3 Tracks, 1 BIG FAMILY. Lives will be transformed to walk into the fullness of their Purpose in Christ. 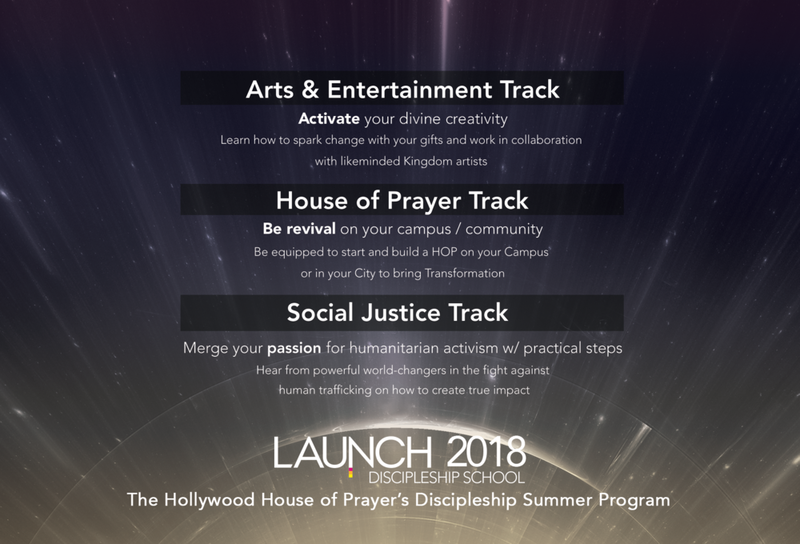 Come join us for Launch Discipleship School this Summer!